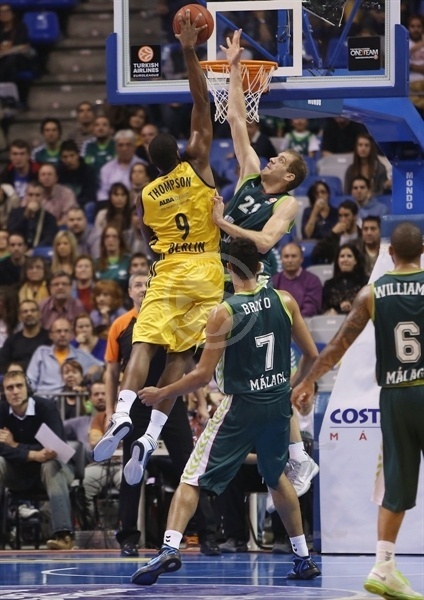 Unicaja Malaga had to dig deep to pull out a 67-62 win over Alba Berlin at Martin Carpena Arena on Thursday night. The two teams exchanged leads for more than three quarters. A 6-17 second-quarter run gave Alba a 5-point halftime lead, but the hosts quickly erased the deficit in the third quarter and then used couple of tough three-pointers from Marcus Williams in the final four minutes of the fourth to hold on to a slim lead. 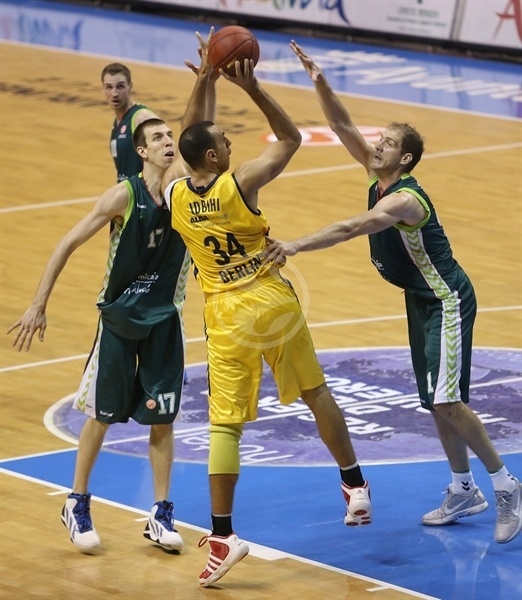 The victory put Unicaja in sole possession of the second place in Group B with a 3-1 record, while Alba dropped to 2-2 and into third place. 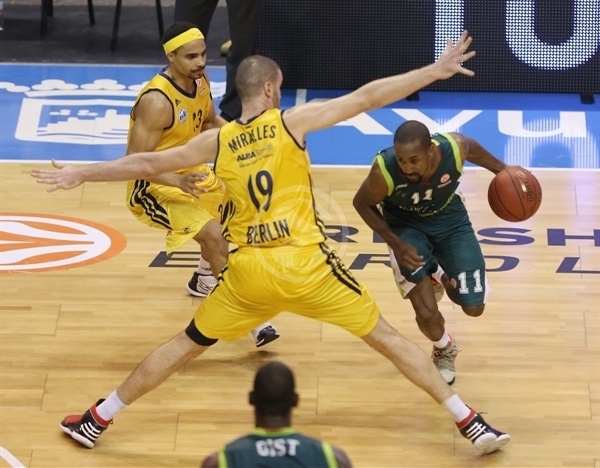 Earl Calloway led Unicaja with 14 points, and Krunoslav Simon had 12 points, 7 rebounds and 4 assists. Augusto Cesar Lima and Txemi Urtasun each finished with 9 points in the winning effort, while the Berliners saw Deon Thompson amass 17 points and 8 rebounds. Heiko Schaffartzik finished with 14 points and Albert Miralles grabbed 10 rebounds in addition to his 4 points in defeat. Thompson opened the game with a blocked shot on one side, and a layup on the other. Txemi Urtasun answered with a triple, but Zach Morley and Nihad Djedovic gave the Berliners an early 3-6 advantage. Simon hit a triple to tie the game, and after a Yassin Idbihi layup and Luka Zoric's split free throws, Simon hit another triple to put Unicaja up 10-8. Alba grabbed the lead once again through Thompson, but Simon scored a layup and then assisted Calloway for a fast-break layup of his own, giving hosts a 14-11 advantage after six minutes of play. A Calloway triple made it 17-12, and after Djedovic and James Gist traded layups, Zoric scored inside to give Unicaja a 7-point advantage. In the final minute of the quarter, Zoran Dragic split free throws and Schaffartzik beat the buzzer with a high floater to make it 22-16 after 10 minutes. Berlin came out aggressive for the second quarter and held Unicaja struggled without a field goal for more than five minutes. In that time, Vule Avdalovic hit a triple and a layup in low post from Sven Schultze to cut the lead to 1. Then Thompson’s basket-plus-foul made it 23-25. 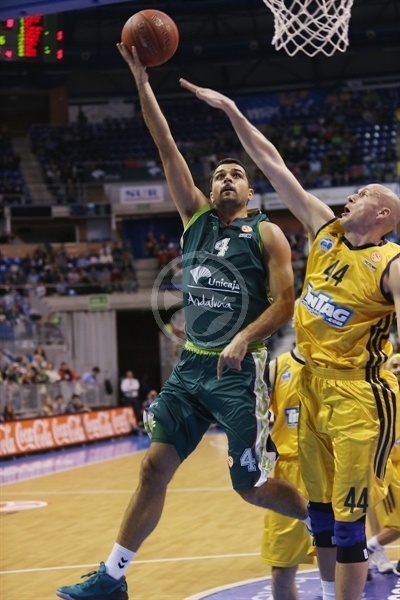 Urtasun powered his way to end Unicaja’s drought and tie the game. Unicaja briefly regained the lead through Simon’s crafty layup, but Thompson responded with couple of jumpers at the other end. Idbihi added a shot from close range and Avdalovic hit a triple capping a 2-9 run and making it 29-34 with less than a minute to go in the half. That ended up being all the scoring in the quarter, as Berlin took a 5-point lead into the break. 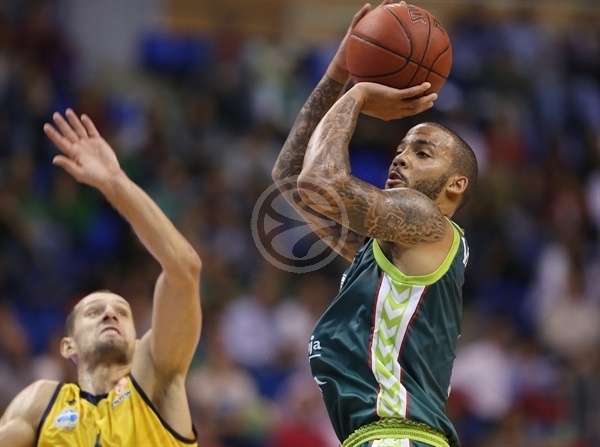 Zoric and Calloway scored on the first couple of possessions of the third quarter to cut Unicaja’s deficit to 33-34. Morley scored inside for Alba, and Augusto Cesar Lima hit a mid-range jumper to keep the hosts within 1 point. Lima scored again, this time underneath the rim on a Zoric assist, to give Unicaja a 37-36 advantage, while Urtasun scored to extend it into a 10-2 run and make it a 3-point game. 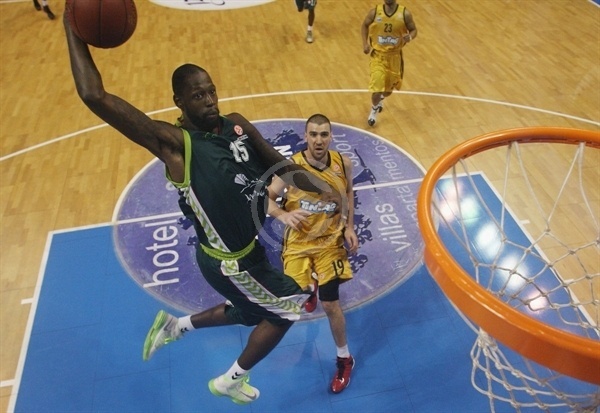 After Coach Sasa Obradovic called a timeout, Alba tried with a zone defense and DaShaun Wood scored a fast-break layup. 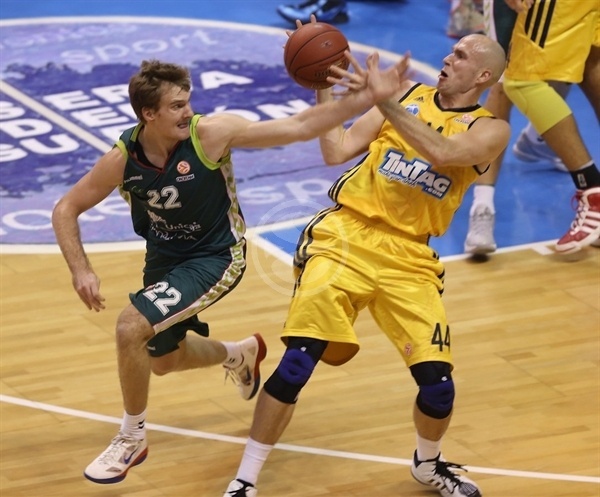 Zoric answered with a jumper, but Schaffartzik beat the shot clock with a triple that tied the game at 41-41. 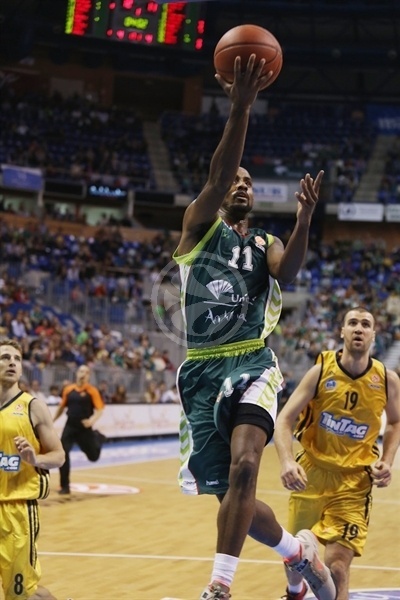 Unicaja ended its next three possessions with a turnover and Miralles scored a layup to put Alba back into the lead. 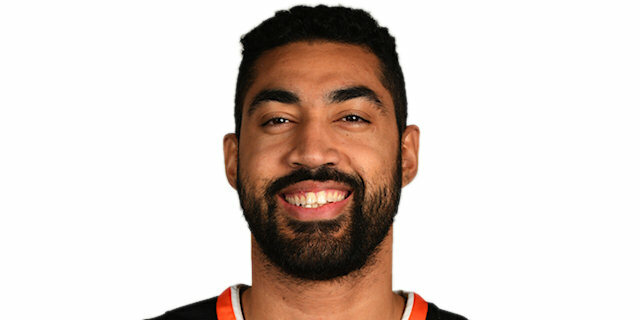 However, Simon ended a three-minute Unicaja scoring drought with couple of free throws, and Gist made couple of dunks – a fast-break one-handed slam and two-handed put-back as time was expiring to take a 47-43 lead into the final 10 minutes. A Calloway three gave Unicaja a 7-point lead to start the fourth quarter, but Schaffartzik replied with back-to-back three-pointers to pull Alba within 50-49. The Berliners went up by 1 with Thompson converting on a high-low, but Lima snapped 0-8 run to put Unicaja back in front and Calloway stole a ball away from Schaffartzik and raced for a layup and a 54-51 advantage. In addition, Unicaja stepped up on defense, forcing Alba into missed shots and turnovers and not allowing the visitors to score on seven consecutive possessions. In the meantime, Marcus Williams banked in a three-pointer to give the hosts a 6-point lead, and after Yassini’s 2 free throws, Lima’s dunk-plus-foul made it 60-53 with less than two minutes to go. However, Thompson and Morley each dunked in the next 30 seconds to make it a 3-point game. Calloway’s jumper extended the lead to 62-57, and after Thompson hit 2 free throws to make it again a 3-point game, Williams hit a shot-clock expiring triple with Wood’s hand in his face to give Unicaja a 65-59 lead 32 seconds before the end. On the ensuing possession, Schaffartzik missed a three-pointer and Urtasun’s 2 free throws sealed the deal. "I feel very well. Coach is giving me playing time and I am earning it. He always corrects me when I do something wrong. I am happy and try to give my best to the team. The most important thing is that we are battling hard and winning games, including this one against a very good team, who gave us a hard time. We managed to stay calm and make the right choices in crunch time. We now have to get ready for the next game."